The Incredible Hulk has always been extremely hard to kill, but that just became even more difficult to do in the pages of Immortal Hulk. Spoilers incoming for Immortal Hulk #8, so if you haven't read the issue yet you've been warned. So the Hulk finds himself in a rather precarious situation, as he is literally split up into jars to be studied by the scientists of Shadow Base. After the lead scientist gets chewed out by his boss, he isn't very happy (you can thank Captain Marvel or that by the way), and is even more incensed when Hulk's head starts smiling at him. He tries to intimidate Hulk, saying they are going to experiment on every part of him and even cut his smile off, but Hulk keeps smiling, and he can't figure out why. 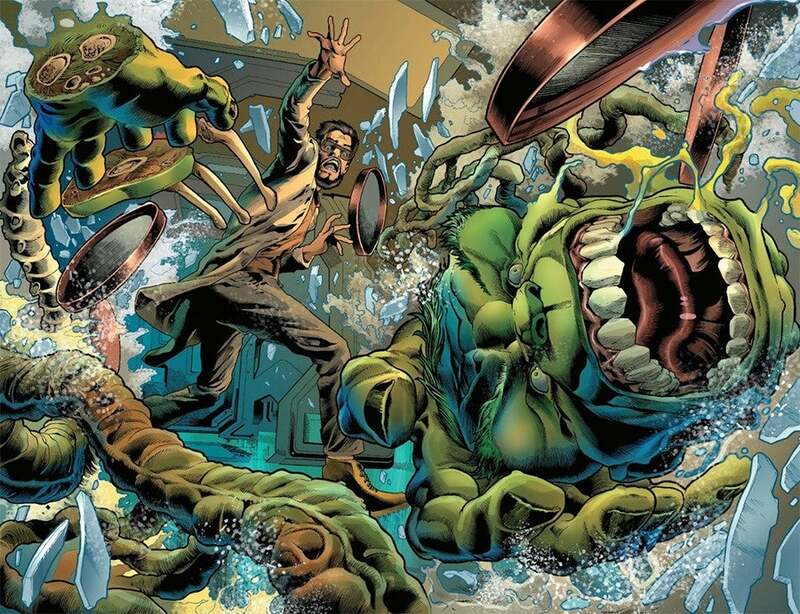 In another jar Hulk's hand starts to move though, and as the scientist realizes what's happening, Hulk begins to snap his fingers, shattering all the jars in the lab and sending his body parts careening towards the floor. Hulk's body continues to come together as the scientist runs away, but he finds himself in the midst of Hulk's reassembling body. 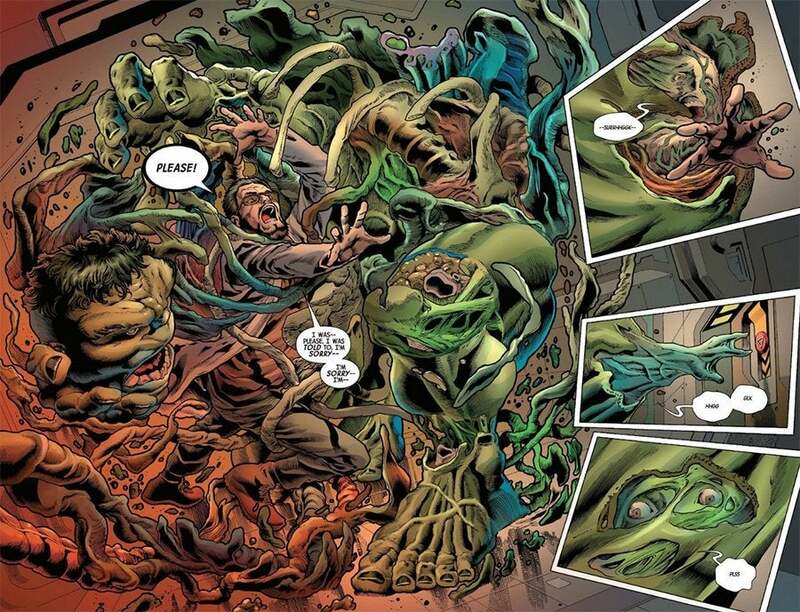 He pleads with Hulk to let him go but Hulk's body continues to merge around him, eventually overtaking him completely, leaving only the shape of his hand reaching out of Hulk's chest, and eventually disappearing into Hulk completely. So, it appears that not only can Hulk survive being split apart, but his body will reassemble itself as soon as it can naturally without the aid of any other medicine or aid. He can also it looks like absorb matter (in this case, a human person) into himself if the need arises, and it will just become part of him. Another noteworthy ability is how he got out of the jars to begin with. 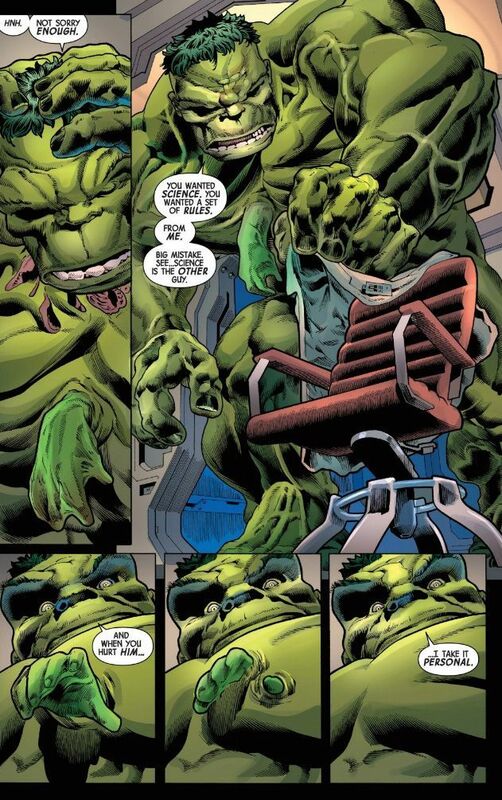 Hulk was able to control his hand essentially with a mental tether of some sort, as it was in a separate jar and not connected physically to his head or the rest of his body. Granted, you don't find yourself chopped up and put in jars all that often, but we're sure he can find other ways to utilize these new skills. You can check out the spoiler images above. "Bruce Banner is dead. His corpse has been dissected, his organs catalogued, and his inner workings are being studied by the scientists of Shadow Base. Bruce Banner is no longer a threat. That just leaves the IMMORTAL HULK..."
Immortal Hulk #8 is in stores now.